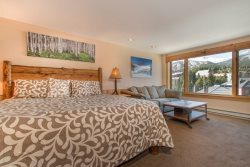 This is a luxurious ski-in/Gondola-out condominium unit located in the heart of Breckenridge at the highly sought-after Mountain Thunder Lodge resort. The elegant complex is tucked away in the quiet pines near Peak 8, offering true mountain taste and excellent walking proximity to both historic Main Street and the Gondola. And, at the end of the day, you can ski home off of the Lower Four O'Clock / Gondola Skyway Ski Back trail. Mountain Thunder Lodge has superb amenities: The grand lobby features a spacious seating area decorated with log accents, slate floors, plush furniture, and a gorgeous fireplace. The resort offers entry to a heated outdoor pool and hot tub area with a gas grill and children’s play area. Additionally, guests have immediate access to a fitness center, complimentary shuttle services, and other terrific conveniences. Guests also have a personal ski locker for use located are the corner from the elevator bank on the first floor. Guests may also access the amenities at One Ski Hill Place, a sister property, which features a movie lounge, two lane bowling alley, spa and two indoor pools. At 1025 square feet with a private wrap-around deck, our corner condo is one of the largest units at the resort and only shares one wall with the adjacent unit. Similar to the resort lobby, our unit features beautiful rustic stonework and wood throughout and is topped-off with granite in the kitchen. In addition to newer appliances and pretty granite counters, the condo’s kitchen comes fully stocked with all of the plate ware, utensils, and mixing bowls that you will need to make your stay comfortable; yes, we even have a coffee pot. The kitchen opens up directly into the roomy dining and living areas. From here, guests can enjoy the large flat screen TV and great views from the private deck all without leaving the comfort of the unit’s gas fireplace. There are two big and well-appointed bedrooms in this unit. The master bedroom features a king bed, a flat screen TV, and an en suite full bathroom. The master spa includes a double vanity, soaking tub, separate shower, and stonework throughout. In the guest bedroom you will find a queen bed and a third flat screen TV. The guest bathroom is right across the hall from the guest room and extra sleeping space can be created by utilizing the unit’s queen sleeper sofa. Vaulted ceilings in the bedrooms and large windows make this unit bright and open. One parking space in the heated, underground garage. It was easy scheduling a reservation. It would be nice if they detailed the amenities better, such as the use of One Ski Hill, the outdoor pool located on site and the tunnel access. The property is very nice with excellent views. It is conveniently located to the gondola and Main Street. we loved the resort and couldn't beat the location. Walking distance to both the gondola and town. Great stay. Great condo, close to town and gondola. This unit is in the perfect location just across the road from the gondola parking lot, access via tunnel under the road. The same lot has access to the free bussses to main street and across town. Under ground parking, but the room key is difficult to use for the garage. Condo had nice view of the green runs past the balcony, even saw a few deer walk up the trail in the morning. This location was very close to downtown Breckenridge (a few minutes on foot) and was the perfect place for my husband, my in-laws, and I to vacation in the summer! The pool and hot tubs were perfect for the sunny afternoons, and it is probably as close as you can get to the gondola. The place was clean and welcoming upon arrival, and the porch provides you with a perfect view of all the stars at night. Overall we had a great vacation and were very satisfied with our stay. Convenient, Great Wrap around Porch, all you need! Great location with easily getting on slopes by short walk or free shuttle. Ski home right to your back door. The unit is very comfortable with all the amenities and a Great Wrap around Porch for a relaxing afternoon watching skiers go by and the sun go down. Beds are very comfortable, living area and kitchen very nice. Would be a great place to visit in the Summer as is so close to town. The staff at the front desk were very accommodating and the complex very comfortable. Will hope to be back again soon. Mountain Thunder was an amazing trip, place was super clean, very close to the mountain and the hot tubs and pool were great. Would totally recommend staying here for anyone looking to visit Breckenridge or Vail. Great spot in a fantastic ski town. Although we were there in the off season, there was plenty to do. The family had a blast!